The former gangland figure had pleaded guilty to manslaughter. 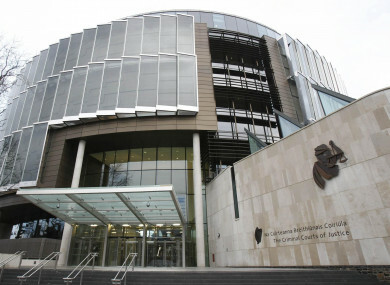 The Criminal Courts of Justice in Dublin. DUBLIN CRIMINAL BRIAN Rattigan, who admitted killing his former friend and wrote a letter of apology to his mother asking for forgiveness, has been jailed for nine years at the Central Criminal Court for manslaughter. Rattigan (38), formerly of Cooley Road in Drimnagh, has been in prison for most of his adult life and pleaded guilty last October to killing 21-year-old Declan Gavin. Gavin was stabbed to death outside an Abrakebabra fast-food restaurant on Crumlin Road in Dublin in the early hours of 25 August 2001. He received two knife wounds, one to the hand and a fatal one to the heart. Rattigan went on trial for his murder twice in 2009. The first jury could not reach a verdict but a second jury convicted him. However, that conviction was successfully appealed in 2017. The former gangland figure was due to go on trial for the crime again this month, but the State accepted his plea to manslaughter when he entered it on arraignment on 22 October 2018. The convicted criminal also said on the same occasion that he was sorry to the victim’s family and anyone else he had hurt through his actions. Prosecuting counsel Pauline Walley SC said at the sentence hearing in December the Director of Public Prosecutions had accepted a plea to manslaughter from Rattigan as the case’s “frailties” were likely to render the success of another murder trial “questionable”. Rattigan has been in custody since 2003 and is currently serving a 17-year sentence imposed in 2013 for controlling the possession of drugs for sale or supply from “within the prison walls”. This was backdated to 2008 and the expiration date was May 2025 but, allowing for remission, Rattigan was due for release in November 2019. At a sentence hearing this morning, Mr Justice Michael White sentenced Rattigan to nine years imprisonment, backdated to 1 October 2018. The defendant did not react when the sentence was revealed. Email “Criminal Brian Rattigan jailed for nine years for killing former friend ”. Feedback on “Criminal Brian Rattigan jailed for nine years for killing former friend ”.